Short Range Order, what is it and why is it tricky? Modelling short-range order (SRO) is tricky. Since in a system with SRO you cannot assume that all unit cells are the same, conventional crystallographic ideas — like Rietveld refinement or conventional single crystal refinement of diffraction data — just don’t work. These tools are useful for giving you the global average structure, but they don’t tell you about the local configurations that make up that average. It is a bit like looking at the average of a room full of people. The average person might be 45% male and 55% female, 1.7m tall, 68kg in weight… but there is a lot more information to be had. What is the average weight of the males? Average height of the females? And, of course, the average person does not really exist, so knowing this average might not be very useful. Similarly with materials, if we want to know how the useful properties arise from the structure and we only have the average structure, then if the system shows disorder, then this average might not ever actually occur, so doing crystal chemical calculations based on it will lead us astray. A good example of this is the family of relaxor ferroelectrics, one of the best known being PZN, PbZn1/3Nb2/3O3. It is a perovskite, which we’ve seen plenty of this year. In this case, the PZN unit cell can be modelled by considering the Pb sites to really consist of 12 Pb sites, one along each of the  directions. 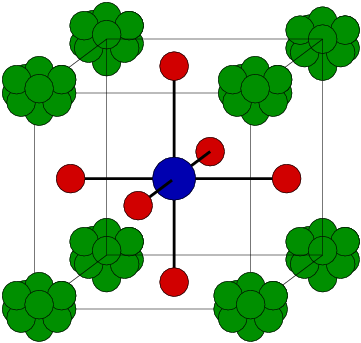 A unit cell of PZN, with Pb (green), Zn.Nb (blue) and O (red). The Pb are modelled as 12 split sites, on each of the  directions. But what does the diffuse scattering look like? 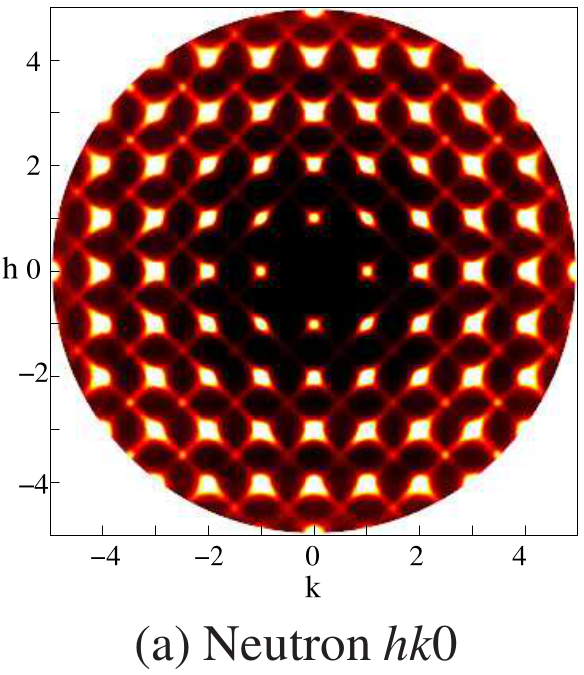 Diffuse scattering from PZN, (a) in the hk0 layer and (b) in the hk1. Streaks, diamonds and other shapes are all clearly visible, all containing information about the SRO in PZN. Now, the diffuse scattering in PZN can be modelled quite well by assuming that the Pb displace along  and these displacements are correlated in certain ways, and that the other atoms then relax around this Pb configuration. The problem is that these models are largely descriptive and artificial. They are based on human interpretation of the data, and do not necessarily relate directly to the underlying chemistry. In the simulation, atomic positions were swapped around and configurations kept or rejected based on whether they reduced the global instability index or not. This was after initial random distributions had been established based on the average structure. This means that the histograms of atomic separations always give the correct average and overall atomic displacement parameters, so all this SRO can be ‘hidden’ inside a conventional average structure. Calculated hk0 diffuse from PZN. 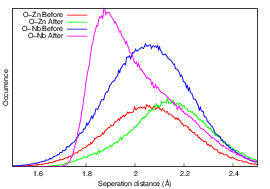 And this approach really can give diffuse scattering which looks a lot like the observed and which reveals what is ‘inside’ the average and see how the Nb behaves compared to the Zn, and so on…so below we can see that the O-Nb distances change compared to the O-Zn, even though there is no long-range order in the distribution of Nb and Zn. By modelling the SRO, it is possible to see how the environment around Nb is different to that around Zn, while retaining the overall average shown by conventional studies. The highly structured diffuse scattering, and the local ordering that gives rise to it, can exist in the system without influencing the outcomes of conventional structural studies. This indicates that short-range order may be present, and crucial, and unsuspected, in many systems whose structures are thought to be thoroughly determined. This is all from work described in a paper by Whitfield et al. Triglycine Sulphate: Ferroelectic, Pyroelectric, Bolometric. Figure 1: (a) Shows part of the unit cell of TGS in the ferroelectric phase (T < TC) and (b) shows the paraelectric phase (T > TC). 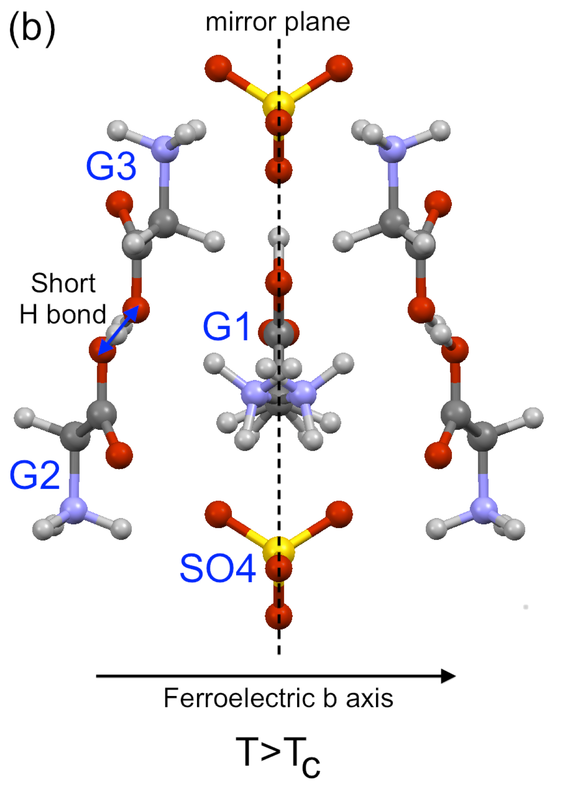 In the paraelectric (non-electrically polarised) state, the middle glycine, G1, is just as likely to be ‘bent’ to the left as to the right, but below TC the molecules ‘choose’ a side and a net polarisation results. 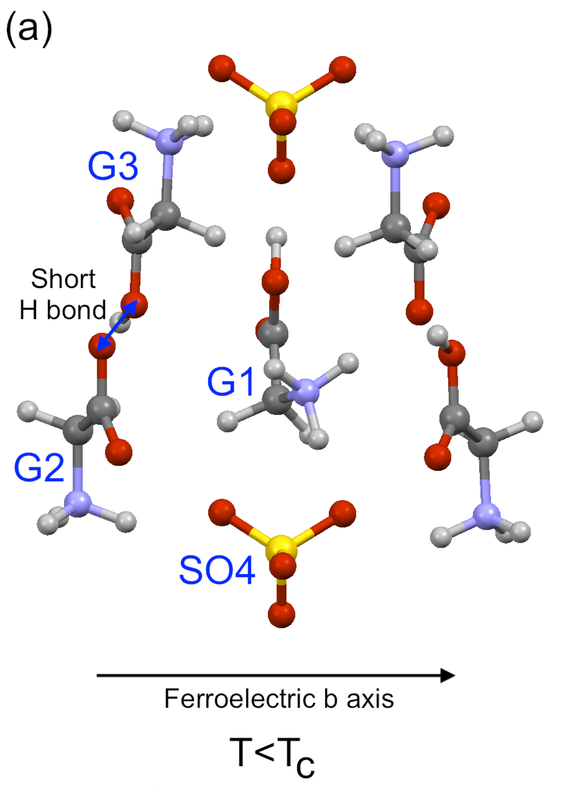 Triglycine sulphate, (TGS), (NH2CH2COOH)3H2SO­4 is a molecular ferroelectric. It is used as a detector in IR spectroscopy, amongst other things. In a ferroelectric crystal (for example PZT), each unit cell has a small electric polarisation — roughly speaking, the ‘centre of mass’ of the positive charge distribution is different to that of the negative charge. If all the cells in a crystal have polarisations pointing the same way, the crystal will be electrically polarised. This is useful in a number of ways — for example, piezoelectric materials (like quartz and newer materials like PZT) can be used as little motors and actuators, and for turning waste motion into electricity. In TGS, the electrical polarisation comes mostly from the NH3+ group on the G1 molecule, which is disordered at high temperature (well, the critical temperature TC is only 49°C in TGS and 62°C if you replace the H with deuterium, so not very high temperature). This means the molecule — G1 in figure 1 — looks symmetrical and in fact the left half is the mirror of the right (and vice versa). As it is cooled down the NH3+ group ceases to be equally likely to be to the left or right, and settles down on one side of the mirror — breaking the symmetry. Through a combination of molecular interactions and electrostatics, nearby molecules choose the same side, and this spreads to the whole crystal (especially if it is cooled in an electric field) giving an overall polarisation. 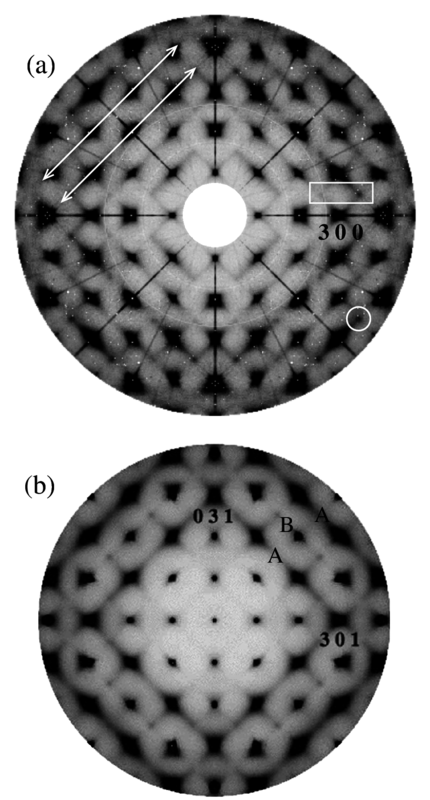 Figure 2: Maps of a small region of reciprocal space (the diffraction pattern) measured at different temperatures. 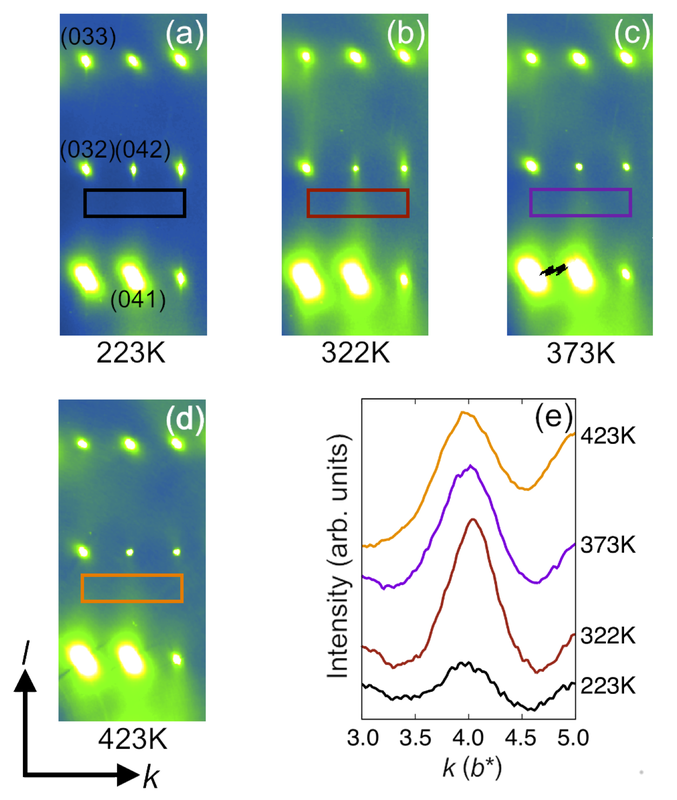 The rectangles enclose a streak of scattering that comes from small regions in the TGS crystal where NH3+ groups are all lined up the same way. (e) Shows that this streak is most intense at 322K, which is the critical temperature. Above this temperature, the small regions shrink and below it the long-range order sets in, also causing the small domains to vanish. The structure of TGS has been known for a long time. The work on its short-range order is more recent.